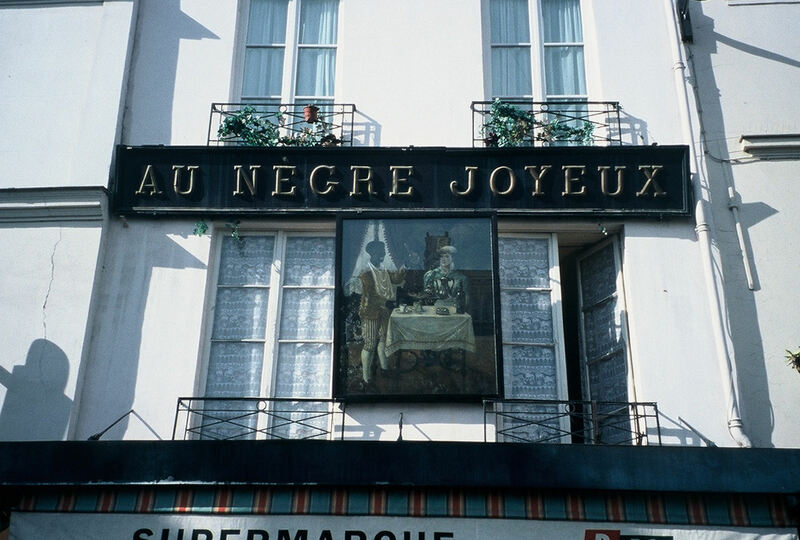 The Internet is abuzz with the news that the sign "Au Nègre Joyeux" and the accompanying image are to be moved to the Musée Carnavalet (Museum of Paris History). Major French news outlets such as Le Parisien, France 24, and Le Figaro published stories announcing the heavily debated decision by the Conseil de Paris (Paris' Municipal Council and General Council for the Department of Paris). 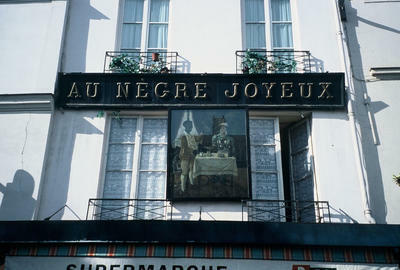 Au Nègre Joyeux was a chocolate factory that operated at place de la Contrascarpe in Paris' 5th arrondissement during the 18th century. It opened in 1748. Several years ago, the painting's glass frame was broken by vandals. It remained in place for many months before being removed for restoration. Shortly after being re-installed, it was defaced again. The glass of the frame was shattered and spattered with paintballs. A quick look at the image leaves the impression that it depicts a black man serving a white woman, and articles describing the painting indicate the same. 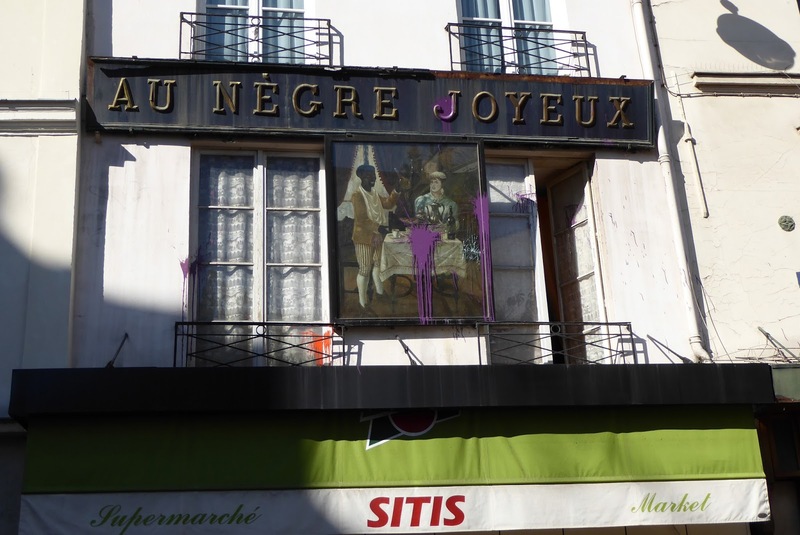 However, upon closer inspection, one can see that the woman is serving the man - she appears to be wearing an apron and holds a tray that supports a large pot presumably filled with hot chocolate. Both are smiling. Many who want the sign and image to stay believe that a plaque should be installed to explain the history behind it. ...le projet de création d’un musée de l’esclavage, de la traite et de ses abolitions soit travaillé entre l’État, la ville de Paris, les associations concernées et le Comité national pour la mémoire et l’histoire de l’esclavage. 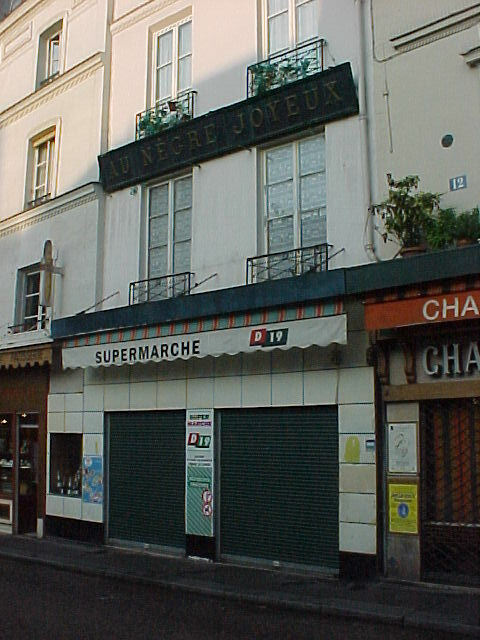 The final decision about the establishment of the museum, which would be located in Paris, rests with the French government.